JD. First of all Craig, I assume that yesterday’s revelations about Rangers‘ debt levels came as no surprise to you. 14million. The accounts prove that. It’s factual, anyone can look at the figures. The liabilities have actually reduced, not increased as the media have been implying. He actually makes a very valid point here. Why the figures given yesterday were a shock to anyone is beyond me – after all, it is roughly the figure that many people have come up with in recent weeks and months when factoring in the ‘big tax case’. Liabilities reduced by £10-14million? Would that be perhaps the amount of money saved by the players wage cuts that are being passed off as liabilities? JD. Have you spoken to HMRC in the past to get an idea as to whether Rangers would eventually be liable for the £75 million Duff & Phelps have now made public? CW. I had many meetings with HMRC to try and avoid the administration scenario which in my opinion could have been avoided if they’d done a sensible deal. They refused to discuss the case ahead of the (first tier) tribunal so it was impossible to have a sensible discussion with them. I offered to pay them in full the current liabilities by the end of August this year and I offered to pay £2.5 million a year towards the big tax case whether that be for 10 years, 5 years or whatever. If they’d accepted that deal they would have been paid in full but of course they don’t live on the same planet as the rest of us. I was surprised as I didn’t think they’d want to see a major institution like Rangers going into administration and seeing the mess that we’re seeing now. Why would anyone discuss liability before a judge has found you guilty(for want of a better word)???? One rule Craig, admit nothing. I thought if anything you would know that. JD. They would argue that the reason you’re in administration is that you didn’t pay you’re PAYE and VAT. CW. They would argue that but part of the reason was some of the leaks coming from them and also that some of the bank accounts were frozen so how were we supposed to pay? Through one of the many other bank accounts that you seem to refer to? JD. As far as you’re concerned, you didn’t do anything illegal.? CW. Absolutely, everything I did was based on professional advice. It wasn’t me acting alone, deciding to do things. I was taking professional advice from top law firms, accountancy firms, everything else, every step of the way so I did nothing illegal. 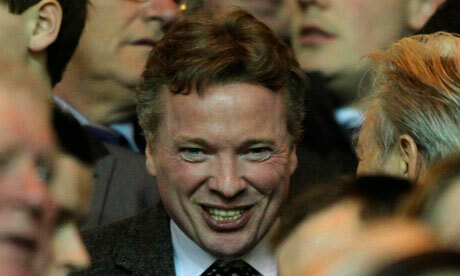 I will defend Craig Whyte to my dying day on that one – he hasn’t done anything illegal. You can argue about the moral situation or the many other breeches of rules that may be involved but illegal….nope. JD. How about the investigations into the Ticketus deal Craig, are you up on where the rest of the money is? CW. As I’ve said before, every penny of the Ticketus deal went into the club. JD. How do you explain that Duff & Phelps say it didn’t? CW. There’s money still in the Collyer Bristow client account but that’s not part of the Ticketus money. JD. What is that money then? CW. I’m not going to go into that but every penny from Ticketus went into the club. Interesting. Completely evasive…but interesting. Every penny went into the club? What Mr Delahunt should perhaps have asked was ‘…and then where did it go?’. It is one thing to say the money went into the club – I once went home with a full weekends bar takings from my work because the safe wouldn’t work – it doesn’t mean that I used it to furnish the place. JD. You said last week that you are still in Rangers to the tune of £30 million. Is that correct? CW. What I’ve said is that I’ve got a bigger stake in Rangers than anyone past, present or future will ever have as I have guarantees on the line for 30 million quid. That’s more than anyone’s ever had personally on the line for Rangers and more than anyone’s ever likely to have on the line for Rangers. JD. Can you explain in layman’s terms Craig how you are due £30 million. CW. Partly because I’ve guaranteed the Ticketus transaction., that makes up a huge part of it. Obviously there are other amounts that have gone in, there’s a huge liability to me and there’s no getting away from that. JD. Do you definitely have a floating charge over Rangers’ assets? CW. Again, that’s factual. It’s there for everyone to see at Companies’ House. There is no doubt that there is floating charge paperwork lodged with companies house. ‘Guarentees on the line for £30million” – guaranteed by whom? A personal guarantee? Or a guarantee by one of your little companies based elsewhere? If I were to be somewhat unscrupulous I could for instance have four Ltd companies doing related things. JD. Is there any problem with you in selling to Paul Murray and the Blue Knights? the Blue Knights and I don’t think there will be a problem long term in doing something with them if that’s the best deal on the table. JD. D you have any idea if that is the best deal on the table? CW. Of course I know what’s there but it’s not for me to say at this moment in time. JD. Do you still feel that exiting administration via a CVA is the best way out of this situation? CW. I think it’s the only way out. I think a liquidation and a Newco is a disaster. I can understand from a business perspective why some people would want to do it but the only ones who would want to do it are people who don’t understand Rangers. It would be a disaster if the club loses 140 years of history and there are also severe penalties which other clubs will be lobbying for if it’s a new start, you can rest assured on that. Any other business, I could see the merits but as a fan, no. JD. When you were doing your due diligence, did you think administration was a probability, or even liquidation? CW. Liquidation was never considered but administration was discussed with the sellers at the time and we always knew administration was a serious option. JD. From where you’re sitting now, how do you see this all ending? CW. I hope we’ll exit by CVA and when people look back on this in years to come, they’ll see it as the beginning of the sorting out a mess that began years ago so, painful as the last few weeks have been, this is a beginning. Hopefully, we’ll get a CVA, the club will be debt free, there will be no tax case any more and the club will be living within its means as it has to for the best long term interests of Rangers. There was no alternative to administration and HMRC were quite within their right to enforce the situation but the bottom line is that Rangers will come out a more viable long term business than it was before I bought the club. JD. How do you feel about the hostility towards yourself Craig? CW. I think I’ve acted in the best long term interests of the club but I can understand how the fans feel. The worst thing for anyone here is the lack of certainty. I’d hoped that this would have been sorted out much more quickly so it’s the uncertainty which causes the frustration and it’s not helped by the Scottish media winding things up and coming out with inaccurate information as we’ve seen again in some papers today, trying to blame me for everything that’s happened to Rangers in the past 20 years. JD. You obviously feel you have had a rough ride then? CW. I’ve had a horrendous ride from the media. The same media that let you fire away at will for 9 months before noting anything dodgy? JD. One of the things which came out yesterday was the question mark over monies from the sale of the Arsenal shares Craig, can you shed any light on that? CW. The money is there. It’s in a segregated client account and that money will absolutely, definitely end up back with Rangers. If what you’re inferring is that I have somehow profited from selling those Arsenal shares personally then that is absolutely not true. That’s what’s being inferred isn’t it? By others. JD. Do you honestly see yourself walking in the front door of Ibrox again Craig? CW. I very much hope so. It’s not going to happen tomorrow and it’s not going to happen in a month but when everything’s died down I hope to be back supporting the team I followed as a boy, of course I do. So do many Rangers fans. I ‘infer’ that you may not ‘walk’ out of them again. JD. D you now feel it is inevitable that you won’t play any part in Rangers future after this process. This entry was posted on April 6, 2012 at 20:28 and is filed under Glasgow Rangers, Tax Case. You can subscribe via RSS 2.0 feed to this post's comments.